State and explain your current profile. Please state your past profiles if any. I’m currently the Associate Director of Marketing at Fairfest Media, a travel media company. I’m the marketing manager for a number of trade shows spanning the travel and urban sectors, product and marketing manager for a number of apps and travel technology products in development, and all around problem solver. I am an MBA graduate from IIM Calcutta with a focus (read: courses taken) in Marketing, Batch of 2014. I opted out of placements to pursue my passion for writing fiction. Consider it a sabbatical of sorts. I knew that if I didn’t pursue my writing aspirations after my MBA, I never would. Also, I didn’t want to be pigeonholed into a corporate career without an outlet for my creative side. In this period, I developed and honed my skills to the point where I am a professionally published writer in the genre of Fantasy and Science-Fiction. My fantasy novel, “The Burnt State”, was requested by and is currently under submission to a few literary agencies. My short-story “The Warrior Boy Who Would Not Suffer” was published in Apex Magazine, a Hugo award-nominated science-fiction and fantasy magazine. My novella “Life & Death in 10E” came in third in a neo-pro Novella Competition. I worked as a Marketing Intern at Airtel during my MBA, where I was responsible for developing a Revenue and Usage Enhancement Strategy for Airtel 3G for the entire state of Himachal Pradesh. I was nominated for the best project. Before MBA, I worked for a year in the AADHAAR project as a Programmer Analyst. The Aadhaar card in your pocket owes some of its existence to my humble engineering and re-jiggering skills. I am mesmerized by storytelling in any form and sort, including but not limited to comics (high art, in my opinion), movies, video games, TV shows, ad films and web series and I leverage all of those learnings in my work. What skills should one develop to follow the career path you’ve chosen? Read. This is true for any career path. Read as widely and as intensively as possible. Read fiction, comics, non fiction, read left, right and center. Be really, truly curious. ’Hey, I don’t know how this thing works.’ Wouldn’t it be cool to find out? The internet is your playground. For any topic you’re interested in, you can find out the answers online, you can take courses from the best teachers in the world online, now! For a marketing career, courses in behavioral sciences and analytical communication are the cherry on top alongside the regular marketing stuff. To become a product manager, you need to have a basic grounding in all things technological, which comes from studying basic programming, web development etc, and marry that with your management skills. What spurred you on to take up an MBA? That’s sort of a no-brainer. I knew I was going that way after my 2nd year at college. My realizations turned out to be a cliché, in the sense that I realized I didn’t care a whit about logic gates and microprocessors. My skills and my enjoyments didn’t lie that way. I loved psychology, the human mind, its working and its vagaries. I loved reading about strategy and communication theories and marketing. Management is the only field where a scientific process of working intersects with fields as varied as history, culture, geography, and human nature. It’s where the hard sciences meet the soft, and that’s where I realized my interest lay. Did you have any prior experience with writing? No. I have been writing since school, but that was mostly ideas and snippets, not long form writing. 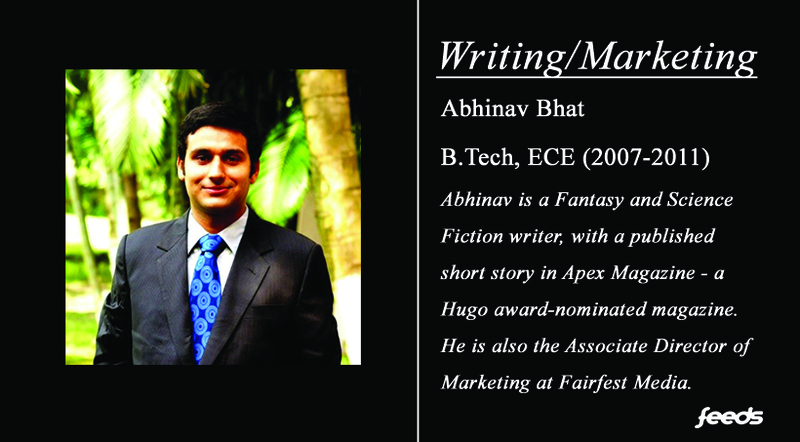 Wrote my first short story in the 2nd year of MBA. Then the novel started. Then more short stories. Yes. I was reading. I have been reading books since I was a child. From Phantom & Mandrake to the Famous Five, the Hardy Boys, the Vedas, and so on and forth to bigger and better things. The number 1 rule for becoming a good writer is: read first. Spend all your time reading. So yes, I was unconsciously on my way to becoming a writer by virtue of reading. How did you decide to take the plunge? Is there an ideal way to decide that you’re good enough to pursue your interests professionally? Well, I could logically sense that it was the correct time. It’s a tight balance. You need to be illogical enough to take the plunge, yet you need to be logical enough to know that in case you’re unsuccessful, you have a safety net. For me that safety net was my MBA. I graduated at the relatively young age of 24, so I knew I had time to explore and I’d always regret it if I didn’t. I was lucky enough that my parents took care of my MBA fees, so I didn’t have a loan on my head like 60-70% (my guess) of MBA grads in my batch. I also lived rent free with my family and brother, another advantage that I had. Know your strengths, know your weakness. Be logical enough to think about how you’re going to survive, be illogical enough to leave nothing for the swim back. Like everything in life, the answer lies in balance. What were the challenges you faced while switching careers? Oh, wow! Where do I begin? Trying to master this entirely new field that I was in no way trained for. Fear. What if I fail? What if I never get a job again? What if I never get a good job again? What will my parents tell family and friends, that their promising young son lost his head and became a loser? What if five years down the line, all my friends are rolling in the dough, while I’m barely scraping together enough to live by? Self-doubt. What if I’m not good enough? What if I’ll never be good enough? What made me think I could ever be good enough? Writing, in itself, is a lonely profession. It is filled with disappointment, rejection & uncertainty. You spend two years working on a novel, only to never have it published. It takes months to produce results. You’re never done. You could spend years iterating on your drafts. It requires mental toughness to slave on something for months, have it rejected with a cursory email, and then shrug it off and start all over again. Sisyphus comes to mind. Is there an ideal route to shift to a career? Any particular courses/fellowships students can take up for this? Well, that’d depend on the career, wouldn’t it?. If I wanted to become a journalist, perhaps I could think about going to journalist school. There’s no ideal route you can identify. If I were to answer for a generic case, I’d say that you map out the skills you have and then see if they overlap with the skills required for a different career, and then find an opening i.e. someone who’s willing to take a chance on you. E.g. a marketer and UX designer have a number of skills in common, which means transitioning from one to the other is feasible. What is the extent one should go to find a balance between work satisfaction and monetary satisfaction? Varies from person to person i.e. your personality type. Some people are extremely driven by money. They put up with extremely stressful and soul-crushing jobs because the money is nice. Some of them burn out, some don’t – they thrive. Others care about what they’re doing and why they’re doing it. They want motivation, objectives – the why, the wherefore, the wherethous. Beyond a certain amount, money fails to motivate them any further. They care more about the work at hand. In my experience, I’ve found that human beings care about solving problems. Give them a problem (make all the numbers in this spreadsheet match, automate this process, optimize this process, sell something to X group of humans, sell more to X group of humans, make X group of humans feel this, make X group of humans feel that) and they’ll want to figure it out. Everybody wants to prove themselves, everybody wants to feel smart. Everybody wants to work alongside people they like. After a specific point, money doesn’t really motivate. There’s a lot of literature out there on this topic. Figure out which kind of personality you are, and what you want. What’s the balance you’re willing to settle for. That I’d regret not studying more. I’m going back and studying engineering concepts that make me excited now, but they were dull as ditchwater then. Students nowadays are lucky to be living the era of online courses. All the knowledge from the best universities in the world is out there. Don’t like what you’re being taught. Fine, go find that course online and learn it from there. I’m surrounded by self taught people who’re better than any college-educated graduate, and I marvel at their ability to learn. They’re hungry for knowledge, of any sort, of any kind. Short Answer: you can’t tell. Work towards that glimmer in a calculated and logical manner, with the occasional leaps of faith. If you’re interested in fashion but studying tech, there’s a lot of design in the tech world. Move towards that. Video games are a perfect amalgamation of tech and storytelling. It’s like there’s a road going towards the horizon and you have a vague notion where it’s going and where you want to end up, so you keep going down it. You don’t just abandon the road and strike out anywhere in the hope that you’ll somehow magically wind up at your destination. I’d also like to say that there’s no shame in not knowing what you want to do in life. Refer to Baz Luhrmann’s Sunscreen. Most adults don’t know what they’re doing, they’re just making it up as they go along like everyone else. You’re the hero or heroine of your story, the rules don’t apply to you. But while figuring out what you want to do, be aware of the restrictions the real world brings. There’s also the issue that what feels right today might not feel right tomorrow, things that you thought you loved might not turn out to be so lovable after all. It generally isn’t that black and white. Things that you might hate from a distance turn out to be quite interesting when you get deeper. The good way is to be happy, and keep working towards what you think you want.